^ Silver, David; Huang, Aja; Maddison, Chris; Guez, Arthur; Sifre, Laurent; van den Driessche, George; Schrittwieser, \tJulian; Antonoglou, Ioannis et al. (2016-01-28). 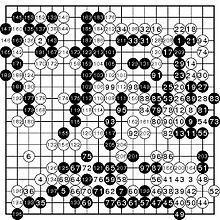 “Mastering the game of Go with deep neural networks and tree search”. Nature. http://www.nature.com/nature/journal/v529/n7587/full/nature16961.html. ^ Dana Mackenzie (9 March 2016). “Update: Why this week’s man-versus-machine Go match doesn't matter (and what does)”. Science. doi:10.1126/science.aaf4152. http://www.sciencemag.org/news/2016/03/update-why-week-s-man-versus-machine-go-match-doesn-t-matter-and-what-does.